Grignard reagents add twice to esters, giving tertiary alcohols (after addition of acid). When treated with a Grignard reagent, esters are reduced to yield alcohols with the introduction of two alkyl groups. In this way, only formate esters generate secondary alcohols whereas other esters are transformed into tertiary alcohols. This reaction employs two equivalents of Grignard reagents. The first equivalent reduces ester to intermediate ketone and the second equivalent of the Grignard reagent reduces ketone to an alcohol. Although an intermediate ketone is neutral and stable, the reaction cannot be stopped here and the ketone cannot be isolated. In this medium ketone will rapidly react with another equivalent of Grignard reagent because ketones are more reactive than esters. The reaction begins with the addition of the Grignard reagent which functions as a nucleophile to the carbonyl function of an ester to give the magnesium salt of a hemiacetal (tetrahedral intermediate). 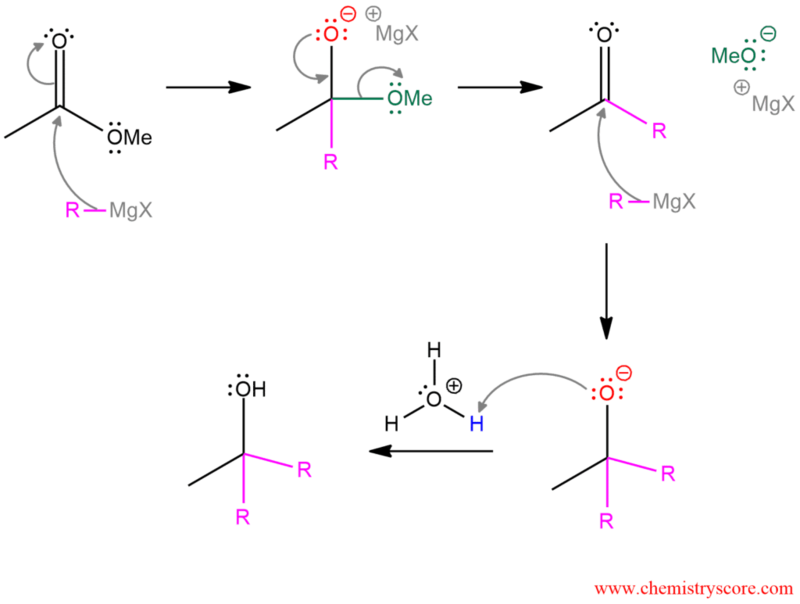 The carbonyl group is re-formed by rapid expelling a methoxide ion as a leaving group, giving an intermediate ketone (or aldehyde, from formates). The carbonyl group is attacked again by a second equivalent of Grignard reagent, generating an alkoxide. After the reaction is complete, acidic aqueous workup leads to the alcohol by protonation.